I am a get information reader. I am not one to just sit down and read a book for the pleasure of it, so that is why I really like this book. Do Great Things is an action book, a self-identication manual. Aaron challenges you from the first chapter with the question, “If you knew you could do whatever your heart was designed to do with complete fulfillment, excitement, passion, and adventure, without the possibility of failing, would you do it?” This really got my attention and made me want to read on. Many of us need to change our thinking in order for us to do great things. Aaron does a great job of helping you through this process with challenging self-examination questions and assignments. He helps you to identify your life’s priorities. Aaron then walks you through goal setting and helps you identify specific goals with a specific plan to achieve your goal, anticipate the obstacles, create urgency, and then document and review your goals daily. “If opportunity doesn’t knock, build a door.” Milton Berle. I love this quote in reference to seeing or making opportunities that others don’t see. I have always been a person that asks lots of questions, and I try to figure things out especially when looking at the big picture. Aaron gives some great examples of this and helps you to think outside the box. Aaron goes on to talk about how Doing Great Things takes hard work, action, leadership, and wisdom. This is a great book and I would recommend it to anyone in business, thinking about going into business, or just wanting to identify their God given purpose in life. 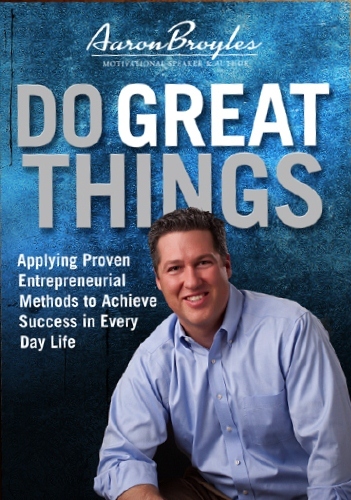 Get your copy of Do Great Things. Most of the men and women we minister to with KBJ are small business entrepreneurs and employees aspiring to be business owners. I have observed a situation I think is more prevalent than any of us would like to admit and one that you need to ask yourself before it is a problem for you. Because if it is a problem in your work or family, you must address it before it gets out of hand and creates a wedge in your relationships. Once again it falls under the title of communication. The need for honest, frequent communication is irreplaceable in all relationships but especially in family and work environments. Here is the question. Are you and your mate in agreement regarding your career and livelihood? Are you both on the same page for your current and future plans as you can be today? Maybe your not in total agreement but compromised towards a mutual end. In either case, once you have decided your pathway, your commitment to work together towards those goals in every way possible is critical for your success. Many wedges can arise making this agreement short lived but the worse one is the blatant misuse of your tongue. Male and female Christians alike seem ignorant to the scriptures that remind us that the power of the tongue has life and death. That holding a grudge between each other and talking about it especiallyh to others has the same effect. God made of each a little bit different. Why will be a question for you to ask Him when the time is right. But with many couples or partners in business together the reality is each can have a different attitude and belief about the same thing the partner does. My wife for instance has struggled over the years living with an entrepreneur and dreamer with a overly positive attitude. She is a more pragmatic, calculating planner who like things more definitive like the monthly budget! Imagine that? She actually wants to know how much money to budget each month for household expenses. Oh, I’m in trouble now!!!! My limited attempt to humor this subject in reality is a very sore subject with some of you reading this right now. You may be like me or my dear wife and know exactly what I’m talking about. The potential for this miss-communication or lack of can drive a serious negative wedge between you and your mate or business partner that can be devastating. There is not an abundance of biblical scriptures addressing this specific issue but we can get pretty close. What you will see is that ultimately communicating, coming to some compromised agreement and honoring and respecting each other is the only way to make these types of situations the best they can be. I would include most importantly, praying for each other that the light of truth would always prevail in all that you do and say with each other. After all, it’s the truth that sets you free. Whether you win or loose, you do it together. No blame. No would of, could of, should of. Take the situations or circumstances on together, work on a solution, then invest yourselves totally to that end and ultimate success. Last night I had the privilege to speak at a Wednesday night ministry group about the Kingdom Business Journal and to explain the origin and purpose of our ministry. The following statement I made sparked considerable interest, some questions and plenty of discussion so I thought I would share it with you too. I mentioned that I received this revelation while teaching Kingdom Business Principles in Ukraine with my brother David Tinney to various christian groups throughout that country. Paul wrote in Eph.4:11-12 that “He Himself gave some to be apostles, some prophets, some evangelists, and some pastors and teachers, for the equipping of the saints for the work of ministry, for the edifying the body of Christ.” Versus 13-16 further explain the purpose which is to disciple and educate and teach truth to the believers so they are not deceived. What I am going to submit to you to think about today is just the first layer of teaching of this portion of scripture. There is much more for another day. Here is the premise I conclude from this reading. Jesus loved teaching with metaphors, parables and word pictures to better understand the spiritual and practical comparison of His Kingdom Principles. His invite for us was to learn, practice and teach His Kingdom’s principles on earth as foundation for living now and preparing us to rule and reign with Him in the millennium and eternity. When Jesus ascended into heaven after His resurrection, He left with us these gifts referred to as the “Gifts of the Ascended Christ” referred to in Eph.4:11. In our natural understanding I think most of us interpret this writing to mean He left a few key spiritual jobs here on earth for ordained ministers in the pulpit to assume in their churches. I happen to believe that. But I found this interpretation to be very limiting of Christ’s army of public ministers of which all the rest of us are, if we believe the command we have of the Great Commission. There is no mention of any building or meeting place in this scripture but perhaps some believe it is implied. Truth is, the definition of “church” to Jesus was His people, not the houses and caves they met in in the first century. I believe Jesus once again in His infinite wisdom, left us special,valuable gifts that included spiritual and practical connotation so that we could all minister the Gospel of the Kingdom throughout the world. Let me be comparatively specific? Apostles = Visionaries for the church who often traveled the countryside planting new churches, getting the local leadership on track with the vision for the Church (people). Prophets = Were the spiritual advisers for the Apostles (leaders) of the churches who would clarify, confirm and emphasis the word of God. Evangelists = Traveled these same areas of the country and at home, proclaiming the saving grace and salvation of Jesus Christ. Teachers = Those trained and learned in the Word were the interpreters for the Way and discipled the flocks towards their maturity. Apostle = The visionary entrepreneur business owner who establishes businesses through out his customer demographic and directs the vision of his company. Prophet = The company consultant or upper management persons consulted for all important matters of the business and who influences the business owner with researched understanding that helps guide appropriate company decision making. Evangelist = Every believer in the workplace can and should be an evangelist. That is God’s command. Pastor = Functions as a manager over departments and groups to make sure the leaders plans are carried out as instructed and successfully but always mindful of the needs of his people. Teacher = Is the role of one who’s wisdom, experience and learning is utilized to assure productivity, efficiency resulting in ROI to the company. So……. where do you fall into this schematic? May I suggest that all of us share in the Ascended Gifts of Christ in one way or another. You don’t have to be in the pulpit or full time ministry to fulfill the calling God has put in your heart. You can now accept the role of life you are currently in and be used greatly if you want to be. And there is no better place of opportunity than your workplace. So once again I say…. go use your gifts to spread the Good News, but only use words when you have to! It’s finally here. Arguably the biggest day in American sports is about to take place Sunday, the NFL Superbowl. Can you imagine being on a professional football team, playing at the highest level the sport can offer? And now it has been determined that you are one of the two best teams in the world. Whether you win or loose the big game, you have the assured distinction of knowing that your efforts to be the best that you could be through your skill, conditioning, training, all those hours of practice and hundreds of played games since you were a kid resulted in this prestigious moment of fame and fortune. No doubt the winners feeling will be euphoric and unforgettable. The business world and it’s competition and challenges are not unlike sporting event contests. For every business industry has it’s Superbowl of accomplishment without exception. Businesses too face sometimes fierce competition and challenges on the pathway to being the best. Ironically both scenarios require a similar process and preparation for that day. Let me point out a few key similarities required to be the best in sports and your business field, then you compare them with your position or company in the marketplace today. DESIRE = It all begins in your heart. You’ve got to want to be successful. GOAL SETTING = Simply put, if you don’t know where you are going, you will never get there! DISCIPLINE = Mental and physical control speeds up positive results. COACH/MENTOR = No replacement for a great teacher. PRACTICE = Study any of the greatest athletes in the world and practice is a priority. CELEBRATE = Everything you win or loose knowing that there is something positive to learn with each experience for next time. I urge you not to limit your career goals with these few practical steps but also include the spiritual, parallel principles that go together to mold your being and purpose for success. Eph.1:11 He predestined you before creation for His purpose. Matt.25:14-23 Jesus teaches the parable of the talents in which He tells us that there are expectations for us to do the best we can with our talents and giftings. Matt.25:24-29 Jesus continues with His admonition that we who are given much, more is expected from us. Col.3:23-24 Paul reminds us to do all things heartily as to the Lord and that our reward is the inheritance, the SUPERBOWL for eternity. Now, you talk about euphoria! Victory in this arena will be a celebration for eternity and with a great many other believers. I invite you to consider these practical and spiritual Kingdom Principles as you continue your journey of life. Realize there will be bumps, bruises and a bloody nose or two along the way. In fact you may even loose a game or two. But always remember, if it were easy……anyone could win the SUPERBOWL. Be the best you can be always and your seasons of winning will be many.